The third? The whole month is dedicated to Black History and the work of people of every color coming together to stand up for the rights of those who were being left behind. February may be the shortest month on the calendar, but it’s jam-packed with special holidays. And, this is the time when Koozies leap out of their hiding places to suddenly appear in mass on cans, bottles and cold little hands at hockey games. In fact, Koozies are great to keep kids’ hands warm in cold arenas! So, how do you make your February marketing stand out from all the rest? Simple. You create your own Koozie Event! It’s that time of the year when messages of deep and lasting love start turning up on pop drink signs, in emails selling everything from automotive parts to vitamins, and FaceBook walls are littered with them. What lasts longer than a page in a magazine or sign in the grocery store? For a message that’s romantic, choose a Koozie that is curvy, like our zippered bottle cover. Then, choose your favorite color – Red is typically for Valentine’s Day but it could be White with Red print as well. Next up, pick a slogan that your customers can share with their personal Valentine, such as “You’re the kind of person that songs are written about ” and suggest that they fill it with expensive chocolates, a bouquet of daisies or a small Tea Rose plant. You can also insert a small canning jar and fill it with topping choices like chopped onions, diced tomatoes, grated cheese, shredded lettuce which is a perfect way to make the break room a bit more interesting. Using your customized Koozies at a party bar to hold straws, plastic spoons, napkins and breadsticks is another way to share a casual party with coworkers. It’s true that lots of people aren’t into all the gooey love sayings that surround the 14th of February. If that’s the case, using a more material message on your Koozies is a fun way to be remembered. We invented a game for our office that we tagged, Spin the Koozie. Using the zippered bottle cover (since it has a pointer end) we set up several circles of coworkers and whoever it stopped at got to pick a secret prize from a jar. We used folded up slips of paper with such things as a candy bar, a free coffee at the diner, 3 free work errors forgiven without mention, an extra 10 minutes at one break tomorrow and the grand prize, choice of any $1.99 sandwich on lunch truck. President’s Day. This is the only day that specifically emphasizes political figures that are long dead. 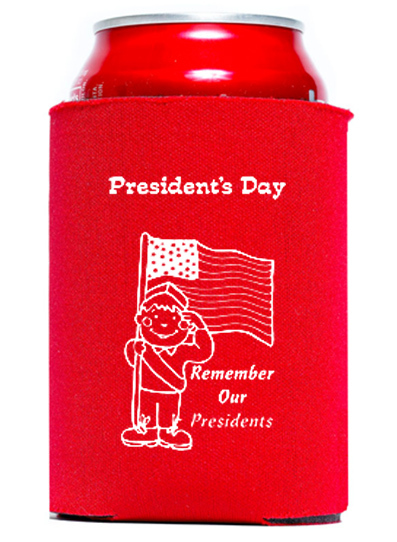 As a marketing tool, a customized Koozie honoring Dead Presidents can become an icebreaker, letting your business celebrate a patriotic position without inciting fights among opposing views. Do you have a favorite President or presidential quip that you’d like to emulate for the occasion? If your primary demographic is female, you might want to choose a saying such as, “Future Princess – President”. Even though there are no dead female presidents – yet – there are First Ladies that have made a difference. It doesn’t matter what industry you’re in or what type of environment you work in, everyone – boss and employee – needs an occasional break from the tedium. Last year, we used President’s Day as our excuse to surprise our workers. We placed a Koozie on each desk with various questions on pieces of paper tucked inside about Dead Presidents. Who was the first President to be born a U.S. citizen? Which President was born on July 4? Which President had pet elephants? 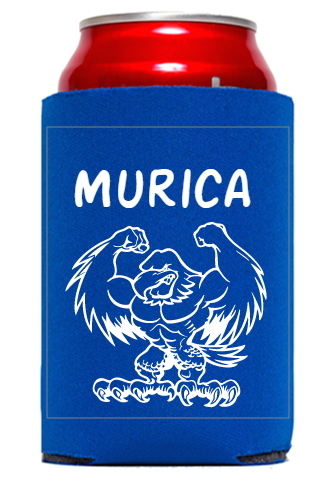 Remember, Koozies ONLY show up when someone is having fun!